Tonči Bilić is one of Croati’s most versatile conductors. He makes successful appearances in concert halls, conducts operas and ballets, and with diverse ensembles from Croatia and abroad, performs works ranging from the Renaissance to contemporary music. He regularly records for radio, television and film production and is the recipient of several Porin recording prizes and the Milka Trnina Award (2008). 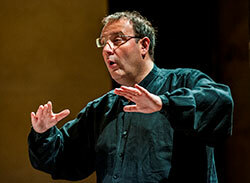 Bilić has worked with the Zbor HRT (the Croation Radio TV Choir) since 1997 and from 2005 until 2016 was its chief conductor. With the choir, he launched a new succesful concert series “Sfumato”.